Reedist Matt Bauder has three albums already out, or on their way, in 2010, all of which establish his vast and diverse talent. Yet by the time they’ve arrived, the average listener might be confused about just who this guy is. Since debuting in 2003 with Weary Already Of The Way (482 Music), an original computer piece built from extended free improvisation, he’s deliberately kept his range unpredictable. “I have given a lot of thought to that, and I see things more of a longhaul situation,” Bauder said. His quintet’s debut album, Day In Pictures (Clean Feed), arrives as his first jazz qua jazz record, flush with elegant changes, swing time and sleek melodies all steeped in postbop fundamentals. His other recordings are far more elusive. The music on Paper Gardens (Porter), cut with fellow reedist Matana Roberts, cellist Loren Dempster and bassist Reuben Radding, veers towards chamber music shaped with generous improvisation, while Creeks (Broken Research), the third album by his long-running trio with percussionist Aaron Siegel and bassist Zach Wallace called Memorize the Sky, melds open-ended free improv with a strong evocation of the AACM’s little instruments, with spacey electronic elements and a broad spatial spectrum. Bauder also discouraged reading too much into any given recording. In fact, Bauder’s full range of activities encapsulate those intentions. 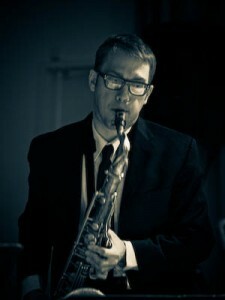 He’s a member of Rob Mazurek’s Exploding Star Orchestra, an out salsa band led by Taylor Ho Bynum and percussionist Abraham Gomez Delgado called Positive Catastrophe, Harris Eisenstadt’s Canada Day and Anthony Braxton’s Trillium E Orchestra, and he regularly subs in the Broadway musical Fela! In addition to his jazz education, Bauder studied composition and electronic music at Wesleyan University and spent a year at the progressive ZKM in Karlsruhe, Germany. Bauder, who moved to New York in 2004, credits his time in Chicago during the late-’90s with helping to form this catholic approach. Between his New York collaborators and the close ties he maintains with many of the musicians he first worked with in Chicago, like bassist Jason Ajemian and Bay Area reedist Aram Shelton, he’s been able to carry on this aesthetic.